Our new collection, 100 years of Berlei, published as Australian bra and underwear brand Berlei blows out 100 candles on its birthday cake, includes Berlei cinema and television advertising dating from the 1920s to the 60s. The collection also showcases beautiful hand-coloured glass slides used for training Berlei corsetieres, the specialists who fitted corsets. It’s fascinating to see the the exquisite fashion, hairstyles and gorgeous art deco design evident in the advertisements, as well as the outdated attitudes. It's sad — but true — that many women, after a few years of marriage, are anything but attractive. But can she afford to lose her appearance? Wingham Chronicle, 10 March 1939. 'Wouldn't she feel one hundred percent happier if she knew that she looked really attractive, that her figure was smart, her weight what she wanted it to be, her skin good, her hairstyle and frocks becoming? Berlei Corsets: Beautiful Lines of Woman Triumphant (Stanley Hawkins, Australia, 1920). NFSA title: 9289. Berlei have a proud history of using models that reflect a diverse range of body shapes. In the 1920s to 1960s their advertising was focused on women learning to overcome their ‘figure flaws’. Berlei glass: Woman in pink underwear. NFSA title: 760218. 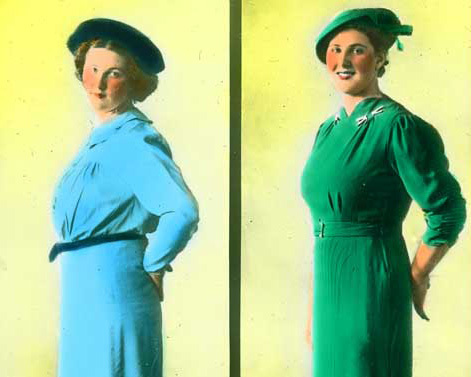 Before and after shots of women made over by Berlei corsetieres are beautiful snapshots of women who are not professional models. It’s easy to see them as a precursor to our hunger for make-over and reality television today. At a time when conversations about the mental load modern women are expected to carry proliferate on social media, these ads are mini-social history lessons. Each one gives clues about historical expectations of women concerning their appearance, deportment, modesty, posture, demeanour, conduct, occupation, dress, health, value and expected level of femininity. The items in the collection are a sample of the 90 Berlei cinema and television advertisements and 329 glass slides held by the NFSA. The slides came to the NFSA from the Berlei archives in 2008 and were in amazing condition given their age. Many were made and hand-coloured in Australia at a time when most glass slides were produced overseas. The beauty, dignity and strength of the women depicted in the ads is striking. Berlei were leaders in hiring women in a range of roles and it's amazing to see the work that went into the design and marketing of an Australian brand legend. This collection of Cadbury advertisements provides a wonderful snapshot of the changing attitudes towards dating, romance and fun in Australia from the 1950s to the 1970s.